Beginners should look for certain specifications in their first set of clubs. The basic clubs that make up a set of golf clubs include woods, irons, wedges and a putter. Hybrids have become popular with beginning golfers since they are so easy to hit. Follow guidelines that explain the features of golf clubs to decide what kind of clubs to buy to give you the accuracy, consistency and distance you desire. To start off your set, select a driver and two or three other woods. The driver should have a large head size, over 430 cc, which will feature a larger sweet spot. This kind of club will be more forgiving of miss-hits typical of beginning players. To help you launch the ball into the air and reduce the possibility of a hook to the left or a slice to the right, look for a driver with increased loft. Drivers for beginning players should have a loft of 12 to 15 degrees. Pick out some woods, also with a larger club head. You might want to stay away from the 3-wood at first, and stick with the more lofted 5-wood, 7-wood or even a 9-wood. Make sure the shaft of the club is flexible, which will provide more distance than a stiffer shaft. Get measured to determine the ideal length for your woods, keeping in mind that the longer the club, the harder it is to hit. 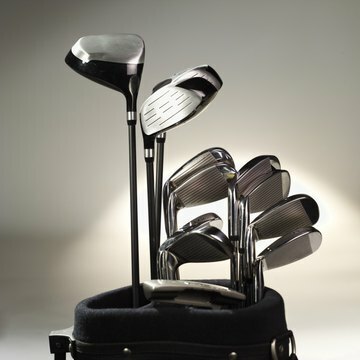 The traditional golf club set includes irons from the 3-iron to the 9-iron. Perimeter weighting can help you keep the ball straight on the target line, and offset club heads help keep the club face square to the target on impact. A wider sole on the club helps to get the ball up in the air. Many new players are replacing their longer irons like the 3-, 4- and even 5-iron with hybrid clubs. Hybrids with a low center of gravity and increased loft help to launch the ball and allow the beginning player to achieve more distance. For beginners, a set might include the lofted 6-, 7-, 8- and 9-iron, along with a 3-, 4-, 5- and/or 6-hybrid for distance. The lowest-number hybrid should go 10 to 15 yards shorter than your highest number fairway wood to avoid a gap in coverage on the course. Beginners will need a pitching wedge and a sand wedge, and perhaps a lob wedge. These lofted clubs are ideal for shots around the green. In addition, choose a putter like a large-head mallet with a greater Moment of Inertia. These putters don’t twist on miss-hits and are easier to hit for short putts. What Is in the Golf Bag?